Who was the fat coach for one of the in state schools. "Frog" some body. His culinary habits were the subject of much discussion at the ball park. Lou St. Amant at then-Northeast Louisiana. He hated Wayne. Back in the old, old, old version of the ballpark (pre-1985, when the infield was where Wilson is now), Wayne used to run the "Home Run Derby" pool -- looked like a football pool, except it was 9x9, and you had the spot in the batting order going down one side and the inning on the other side. The first home run by a Tulane player paid off the pool. If not, he carried it over to the next game. UNO came across town and they had a third baseman whose name I forget, but he had almost as many errors as UNO had played games. Wayne changed the pool that day from "Home Run Derby" to the "E-5" pool. Every time the guy came to the plate, Wayne would start yelling, "E-5!" Absolutely one of the most passionate fans Tulane has ever had. Godspeed. Does anyone have a photo of Wayne? I think it would be nice to find a picture, possibly with other folks on the forum. I pray he puts in a good word for us with the Man upstairs. Pax. What was Wayne's yogwf name? as far as I know, he never registered, maybe he did. Wayne is being honored, as he was the founding member of the YOGWF predecessor. If not for him, we would not be here today (or we would be in another format). We all supported Wayne at scout.com, via $$$$ (both admins and many mods were paying members) and via communication support. If not for Wayne, Coach Mac, OliverNBlue, among others, Tulane might not be playing Division 1 athletics right now. For this out of state Greenie, you brought Tulane athletics so much closer at a time when there was nobody else in the neighborhood. Had the pleasure of numerous passionate, in depth discussions with Wayne over the years. They broke the mold after they made Wayne Picou. I can still visualize him sitting in a near empty Fogelman end zone long before game time chowing down on nachos and waiting for things to heat up. God speed. But, you know what, he's the reason at the grass roots level that it ever had a chance of coming into being. He had us all yelling "E5" with our faces pressed against the old backstop! I am very sorry to hear this sad news. 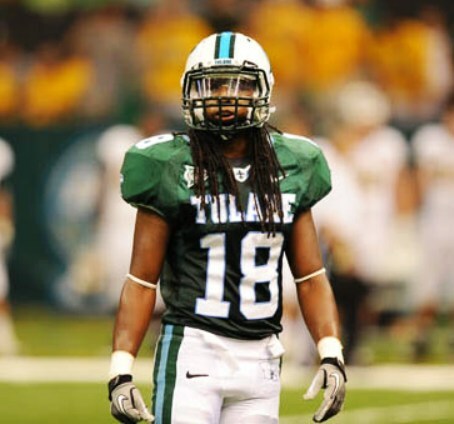 The Tulane nation needs alot more Waynes. When John McCutcheon and Wayne Pıcou are ın theır chaır back seats ın heaven watchıng another Tulane sportıng event, I wonder who tells the best storıes? They'd probably just talk at the same time and drown each other out. Actually, John would probably just let Wayne do the talking and sit back and smile. Man I miss both of them. I'd chuckle at Johns but LMAO at Waynes. I am just now seeing this. I regret not making it over to the hospital to see him near the end; I am so sorry, Wayne, that I did not make it to visit you. So many posters have summarized above how much Wayne has meant to Tulane athletics. Above all, I'll never forget working with him and so many others during the review, numerous, numerous phone calls on strategy, next steps and followup. Everything was on the line, and it was an incredible feeling to win at the end against some long odds. The last time he and I had a lengthy discussion was after he'd been stricken and needed assistance walking, after a game at the Dome this past season. We talked about a new stadium, where to build it, how big, combining it with a new basketball facility in an overall athletics capital campaign. As usual, it was a spirited conversation of substance. I'll miss him. I am really having a hard time believing this. I didn't really know Wayne well, he would call me occaissionally but I certainly did not have the talks that many of you did. Now I really have a hard time picturing Tulane athletics without him. He will leave a giant void that will not be completely filled. I agree that in the past few years he did become more optimistic about the overall future of Tulane athletics and it really helped me become more optimistic as well. God reclaimed a good one that's for sure. I am very saddened at the passing of Wayne. He left his mark not only on all of us in the Tulane family, but also everyone else too. We are much inhanced by his passing through our lives. R.I.P..
Wayne's funeral service will be at Lakelawn on Thursday. More details to follow. As I posted before, we sat under the basket at men's hoops games and heckled everyone; the ref's, the opposing players, sometimes even Roy Danforth. We knew alot of the refs by name and Wayne hated them all, Paul Galvan, Charlie McCarthy, and one he called Brillo Head. There was this one ref who did alot of Tulane games named Reggie Copeland and he took his fair share of abuse. At timeouts, however, rather than walk away, he would stand on the baseline his back to us clearly in the path of the verbal onslaughts. One night we were playing a really bad team (Tulane was up about 15 or 20 pts in the second half) and the opponent had this forward who travelled every time he made an offensive move with the ball. Stanley and Wayne were besides themselves. Wayne was livid, his neck turning beet red. Finally at a timeout the ref, Reggie Copeland turns around and walks toward us and says "Guys, if I didn't let him walk, he wouldn't get to play" We all roared and Reggie Copeland became our favorite ref from then on. PICOU Wayne Anthony Picou on Sunday, March 9, 2008 at 3:35 PM, age 58. Beloved son of the late Antoinette Picou and Elidas Picou. Brother of Bruce A. Bernard and uncle of Leslie Jallans, Lisa Palermo and Laurie Spellman. Relatives and friends are invited to attend the visitation at LAKE LAWN METAIRIE FUNERAL HOME, 5100 Pontchartrain Blvd. (in Metairie Cemetery) on Thursday, March 13, 2008 from 6:00 PM until 8:00 PM. In lieu of flowers donations preferred to the Tulane University Wayne Picou Memorial Fund @taf. To view and sign the guest book, please go to www.lakelawnmetairie.com. Published in The Times-Picayune on 3/11/2008. I think it was a pre season game with an AAU team or athletes in action. But did Picou ever get tossed out?